Found one file extension association related to NASCAR Racing 2003 Season and 1 file format developed specifically for use with NASCAR Racing 2003 Season. 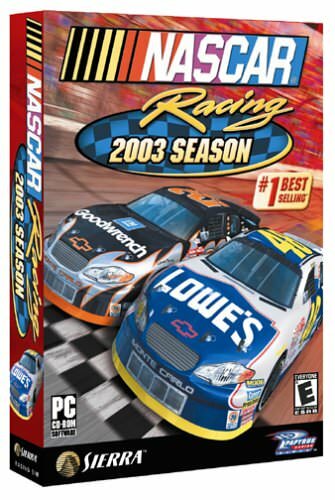 NASCAR Racing Season 2003 brings the intensity, grit, and roaring sound of NASCAR to the PC. This 2003 incarnation of Sierra’s 10-year old series is once again built by Papyrus, the first name in racing simulation fidelity. It doesn’t disappoint. NASCAR Racing Season 2003 features 23 venues including all the real-world tracks in the Winston Cup series, every major driver, and all the licensing NASCAR is famous for. There’s advertising everywhere, from M&Ms to Cingular Wireless and AOL, but that only makes the game look more realistic. If you need more information please contact the developers of NASCAR Racing 2003 Season (Vivendi Universal), or check out their product website.